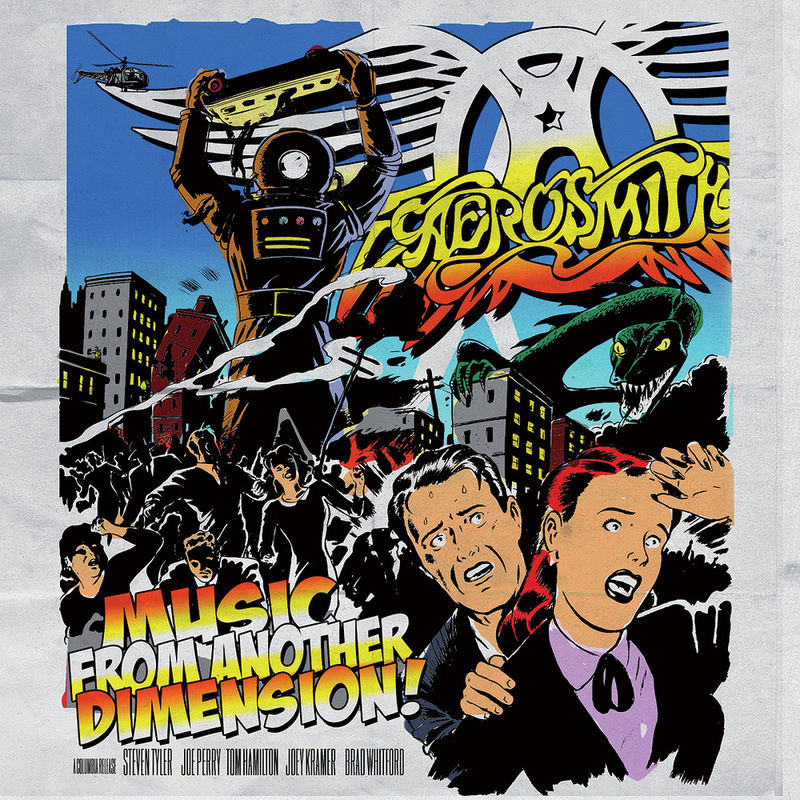 Aerosmith's Music From Another Dimension, released in November, is their first album of new music since 2001's Just Push Play, and the result of a particularly long gestation process; the first sessions apparently date as far back as 2006. Big-name producers like Rick Rubin and Brendan O'Brien were name-checked, but nothing emerged until the band decided to go back to basics with the legendary Jack Douglas, who produced the band's best-selling albums Get Your Wings (1974), Toys In The Attic (1975), Rocks (1976) and Draw The Line (1977), as well as their more recent album of blues covers, Honkin' On Bobo (2004). This photo, taken by Aerosmith's Brad Whitford, shows Warren Huart at Pandora's Box. Both Honkin' On Bobo and Music From Another Dimension have been hailed as Aerosmith's best in years, and "proof that Aerosmith can still rock”. For Douglas, the secret lay in getting the five band members to work and play together again, and in harking back sonically to the rawness of the records he made with the band in the '70s. Music From Another Dimension also saw them do much more writing together as a band than had previously been the case. 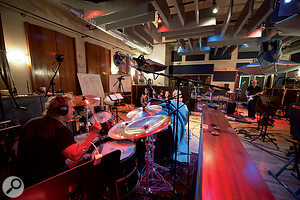 Work on the album began in the summer of 2011 at the band's Boston headquarters, where they have a large recording studio called Pandora's Box. Born in 1969 in Hampshire, Huart moved to the US in 1995 as the guitarist of the band Star 69. He's always had a keen interest in sound and production ("I was that annoying guy in the band who would always lean over the engineer and ask him what he was doing”) and he has worked his way up to become one of the Los Angeles area's most in-demand engineers and producers, with credits including the Fray, Augustana, James Blunt, Korn, and many others. Huart also writes and mixes film and TV music and co-owns Swing House Studios, one of LA's top facilities, with two recording studios and five rehearsal rooms. Douglas and Huart met when the former was working at Swing House a couple of years ago, producing an album for Michael Monroe (Sensory Overdrive, 2011). Today, following extensive work with Aerosmith at Swing House, Douglas stores all his gear at the studio. "I produce most of the stuff I work on these days,” says Huart, "but I wasn't going to pass up the opportunity to work with Aerosmith and Jack Douglas! So when Jack asked me to engineer the album for him, I immediately agreed. He then suggested that I listen to Rocks. I did, and I asked him what room he recorded that album in. He laughed, and said: 'That's the reason I wanted you to listen to it. I want to make a record again that sounds like a band in a room.' So we recorded a lot of the material off the floor, live in the studio, and would then later fix things or overdub parts. We did three months at Pandora's Box, and also spent some time at [guitarist] Joe Perry's studio, Boneyard, and at Steven's studio, Briar Patch. Then the band went on tour to Japan and South America, and after that we spent another five months recording at both studios in Swing House. 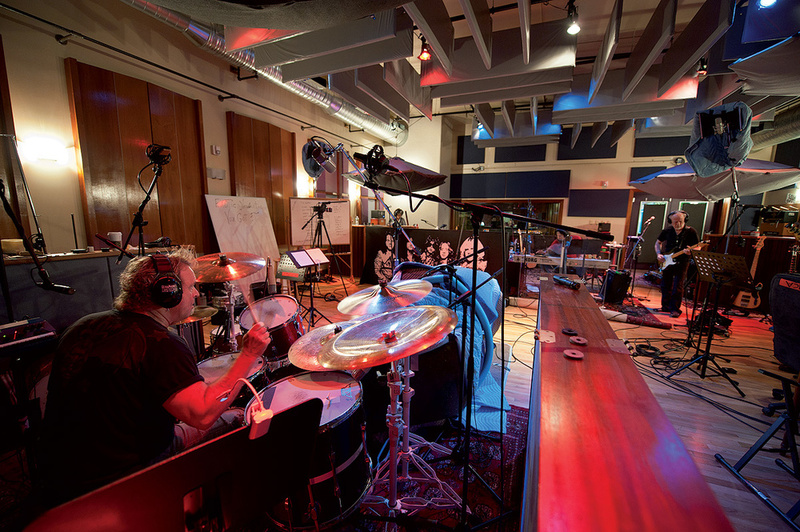 Aerosmith drummer Joey Kramer (left) and second guitarist Brad Whitford lay down a rhythm track at Pandora's Box. The band and producer Jack Douglas were keen that the album should have a live feel. 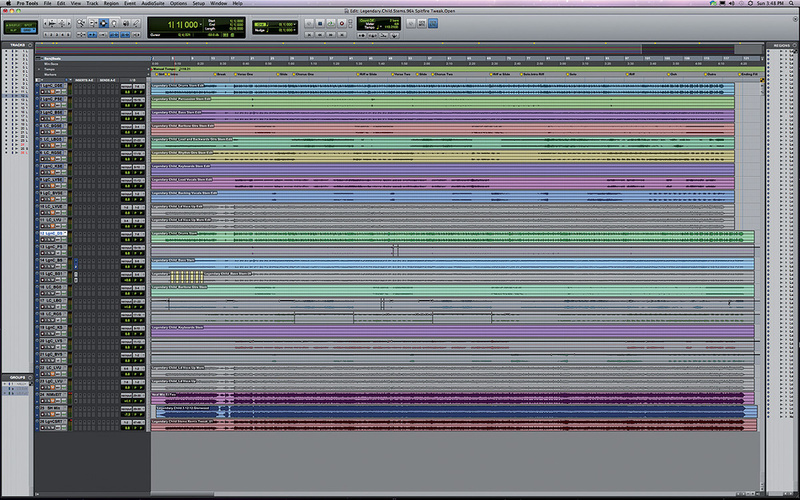 The "digital culture” is evident in the Pro Tools session for the album's lead single 'Legendary Child', which contains no fewer than 270 tracks! Closer inspection, however, reveals that the number of actual musical elements is much smaller: Douglas and Huart recorded each part with a whole posse of different microphones, and chose not to submix these in Pro Tools. 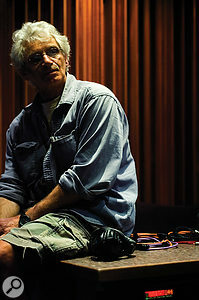 Once Neal Avron had completed his mix, he supplied stems, which Douglas and Huart used to reintroduce some of the dynamic contrasts and fader rides from their original mix. Huart's drum recordings constitute 35 tracks of the 'Legendary Child' session. "For drums, I had a combination of AKG D112 on the inside of the kick, and on the outside, the Sontronics DM1B, a large-diaphragm condenser that sounds similar to the Neumann FET47. We also had a kick tunnel with a resonator on it, on which I had a Brauner mic. There was a Shure SM57 on the snare top and snare bottom, the toms were recorded with Sennheiser 421s, and the overheads were a pair of Peluso 67s. The Peluso mics are ridiculously good and in the $1500 price range, which, for top-quality Neumann clones, is unbelievably cheap. For the room sounds we had Shure and Lewitt mics, which also sounded pretty phenomenal and are not expensive. When I was a kid I thought that you needed a million dollars to record anything, but if you are a creative you can make great-sounding records with Sontronics and Lewitt mics, which are a fraction of the cost of vintage mics. We also put the kick, snare and toms through a PA at Pandora, because Jack had done this on Rocks. I recorded the PA with three Royer ribbon mics, one against the left wall, one against the right wall, and one in the middle of the room, and I blended these in different ways, depending on the track. These ribbons were recorded through Neve Portico 5012 mic pres that Rupert had given Jack. "We made some changes when we recorded at Joe's studio, Boneyard. The gear there is phenomenal. He has a Neve 8028 with 24 channels of 1073 [preamps], and a Studer A800 and more than 30 pieces of outboard, including things like LA2A, LA3A, Urei 1176, Dbx 160, and so on. It has a small live room, so we recorded tight-sounding drums in there, as well as guitar overdubs. Steven also has a great studio, with a live room shaped like a square box, with mirrors on the back wall, so it's super-bright. We also recorded drums there, and at that studio I used the Neumann CMV563, the lollipop mic, on the outside kick, a [Neumann] KM56 on the rack tom and an [AKG] C12a on the floor tom, and a pair of Shure ribbons as overheads. Steve also has a bunch of Neve 1073s, and we used those as mic pres. At Joe's studio and Pandora's Box, we used mainly the console inputs as mic pres. "The bass was recorded in multiple ways. There always was a DI — I used a Demeter DI in LA and for clean DI I always use a Radial Pro D2, the stereo one. I love that thing. I've done shoot-outs, and it always turns out to be the cleanest and the fattest sounding. I then had the Sontronics DM1B on the cabinet, and I also like to mic a 15-inch cab up with another 15-inch cab [ie. a speaker used as a mic]. That's the 'Taxman' bass sound — though Geoff Emerick used an 18-inch cab to record the bass on that song. 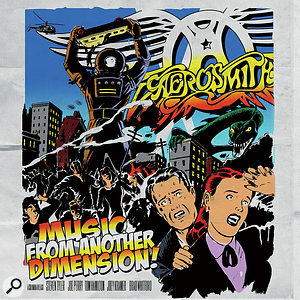 The lead single of Music From Another Dimension, 'Legendary Child' was originally written in 1991 for Aerosmith's Get A Grip album, but never released, and was reworked for Music From Another Dimension. It is also notable for being the only song on the album with three mixers credited. The other 14 songs were mixed by Huart (four songs), Avron (six), Chris Lord-Alge (three) and Al Schmitt (one). Douglas explains: "I was present at every mix for the song, supervising the mixes. I would have liked to have seen Warren mix more songs, because he's a really good mixer, but the label [Columbia], wanted to see what they consider a 'name' mixer. It's funny, because I've mixed 100 albums, but because I don't call myself a mixer, I'm not supposed to mix any more. Suddenly there are all these rules. But I'm fine with that. Warren and I first mixed 'Legendary Child', and the band and I thought we were on the right track, but the label wasn't happy, and Warren suggested Neal. So Neal mixed Warren's mix, and when he was done Steven said, 'You know, Neal's mix is really good, but it is missing some of the stuff where you pushed things too far, which was really cool.' I thought that what Neal had done sounded great, so Warren and I took his stems and remixed them, so we could do some of the pushes that had excited Steven and Joe so much. Huart continues: "The reason why 'Legendary Child' received so much attention was because it was not only the lead single, it was also the first song for the album that we mixed. We were creating the blueprint for the sound of the album, and we had to get it right. Jack, Joe, Steven, Neal and I learned so much about how to mix this album from tweaking this song. Mixing the first song for an album always takes longer, it can take two days, and then the rest of the album you can do one or even two songs per day. My final mixes were a combination of building on my monitor mixes and starting again from scratch. During tracking I'd be doing monitor mixes, of course, but they were done on the Neve or API desks I was working on. When I then laid a mix out over an SSL, it was a different process. "I don't actually use tons of plug-ins while tracking or mixing. I grew up wanting to make records the old way, which was that you record things the way you want them to sound. I don't have 25 DIs with Sansamp, Eleven and Amp Farm plug-ins. I don't tie myself in a knot when doing roughs, because as soon as I lay it out over an SSL console, it's going to sound bigger. It just does. It's the reason why I have an SSL 4000 G in my own studio, Spitfire, which is in a house in the garden of my house in Laurel Canyon. But the SSL gives me an electricity bill the size of the Peruvian national debt! I have to run two air conditioners all the time, one for the studio and one just to cool the SSL power supply! It's a challenge keeping an SSL. "I actually did the initial mix of 'Legendary Child' at Glenwood Studios, also on an SSL. In terms of the effects I used, we had so many tracks with ambience on all instruments that I barely had to add any reverb. We had that extra kick and snare ambience from the PA, as well as the ambience from the Lewitt and Shure ribbon mics. In most cases, the blends of different sounds that made up one part were summed in Pro Tools and then came up on one channel on the SSL. Most of my mix consisted of adding EQ and compression on the console, in the case of the drums, often taking off a little bit of the lows and low mids. You want to keep the additional bottom end you get from tape, but pull out what you don't want. I also sent the kick through a Dbx sub-harmonic synthesizer, to give me some 40-60Hz frequencies, and the return from that came up on an auxiliary channel on the console. I summed the kick and the snare tracks in Pro Tools and added some compression and gating where necessary. Noise gates are so controllable in Pro Tools. When the kick and snare come up on the console, I do like using SSL expanders and gates as well. Jack Douglas and Warren Huart's old-meets-new approach led them to employ Endless Analog's CLASP system at both Pandora's Box and Swing House, to combine the sonic benefits of tape with the flexibility of Pro Tools. 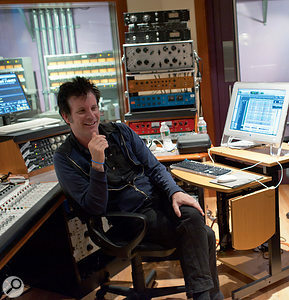 "Jay Messina and I built the desk at Pandora's Box,” explained Douglas, "and it's called the 'Frankenstein' console. It has 24 inputs from a Neve 3340 desk, eight channels of API mic pres, and eight channels of an old Focusrite, and then 36 channels of monitoring through API line amps. I just love the sound of those. We also used a lot of my gear from Pulse Techniques, Retro — like their 176s and Sta-Levels — my Ampex tube mic pres, and several mics, like my Peluso mics, and so on. The studio also has two Studer A800s — one with a 16-track head set, running at 15ips, and the other had a 24-track head set and was running at 30ips. We ran those with two CLASP systems. The CLASP system isn't right for all projects, but it was perfect for this Aerosmith record. It doesn't really affect the workflow, and using it allowed us to have the sound of analogue tape, yet we could edit things and use plug-ins and be as fast and competitive as anyone else. I'm not at all a purist about this. "In 1998, I was playing in a band called Disappointment Incorporated, and we recorded an album with producer David Jerden, who used both two-inch tape and Pro Tools to record us. Pro Tools felt revolutionary, and I needed to find out what it was. People like to bash Pro Tools, but for me as a guitarist it made perfect sense. 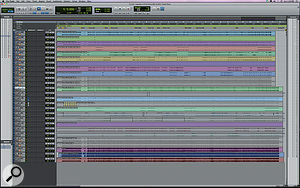 MIDI drives me insane; by contrast, Pro Tools is designed for a guitar-player's brain. Many of the best Pro Tools engineers that I know are guitar players. Keyboard players tend to quantise things, whereas guitar players will push and pull things until they feel good. It's a different mind set. But I like the sound of tape, especially tape compression, and the warmth you get in the lows as well as the silky, smooth top end it gives. In using the CLASP system, we could have that, and still edit in Pro Tools, without any of the drawbacks of working with both media. Normally when you record to tape first, you spend days transferring everything to Pro Tools and then trying to make sense of what you recorded two weeks beforehand. 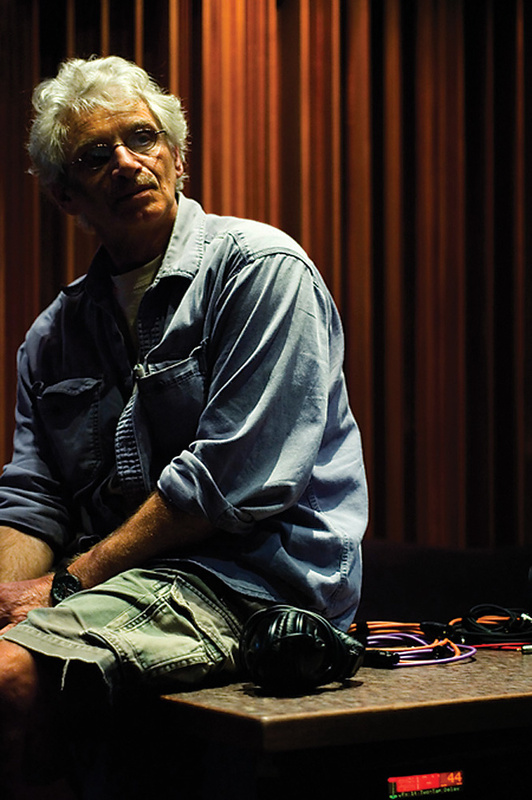 Jack Douglas is one of the all-time legends of the American music industry, whose credits include the Who, John Lennon, Cheap Trick, Yoko Ono, Alice Cooper, Aerosmith, Blue Öyster Cult, Patti Smith, Slash, Supertramp and — as recounted in December 2009's Classic Tracks feature (/sos/dec09/articles/classictracks_1209.htm) — the New York Dolls.